KangaBACK carpet is a brand of carpet manufactured by Kanga that features built-in polyurethane foam paddingr. Kanga also produces a number of installation products to aid your carpet installation. Note that if you need to create a seam between two pieces of carpet in the same room, this should be done first. KangaBACK carpet saves you from installing carpet padding separately. Prepare your working space. Remove all old carpet and furniture from the room. Take all adjoining doors off their hinges and remove from the area. Depending on the height of the new carpet, you may have to trim the bottom of doors that swing into the room before re-installing them. Do not remove the baseboards, the strips of wood between the floor and the wall. Lay double-sided carpet tape around the perimeter of the floor next to the baseboard. Place an additional strip of 24-inch sections every four feet down the center of the room. Don't remove the protective cover from the tape. Roll the carpet out on the floor. Center the carpet and make sure any surplus carpet is distributed equally along each wall. Lift half the carpet and fold it over so it rests on the other half. Remove the protective cover on the tape on the exposed side of the floor. Lay the carpet back down gradually, working from the center of the room to the outer edge. Push the carpet down along the edge to ensure good adhesion with the tape underneath. Repeat for the other half of the floor. 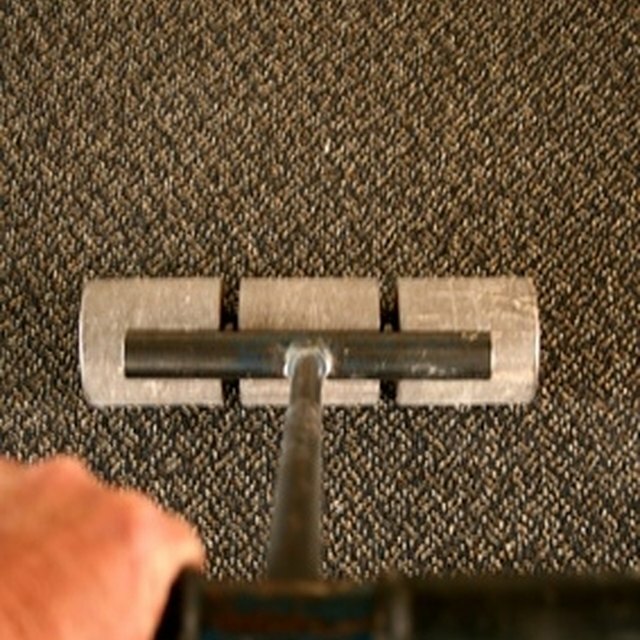 Make a crease along the edges of the carpet that need to be trimmed. Use the putty knife to crease the carpet at a 90-degree angle between the floor and the wall. Cut the excess carpet with the utility knife, using the crease as a guide. Lay the two pieces next to each other, ensuring they are both running in the same direction. Trim the seam edge of one piece of carpet using the carpet cutter. You should aim for the straightest edge possible. Trim the opposite edge. Lay the other piece of carpet over the trimmed piece so they overlap by about 2 inches. Use the edge of the first piece as a template to trim the second piece. Fold back one piece of carpet, and make a chalk line along the floor, tracing the seam line of the carpet. Fold back both pieces of carpet. Apply the seam tape to the floor, making sure it is aligned over the center of the chalk line. Remove the protective cover from the seam tape. Apply a coat of seam sealer along one exposed edge of padding. Press both edges of carpet down onto the seam tape, ensuring a straight, snug fit between the two edges. Kanga: Install Your Own Carpet?